So! 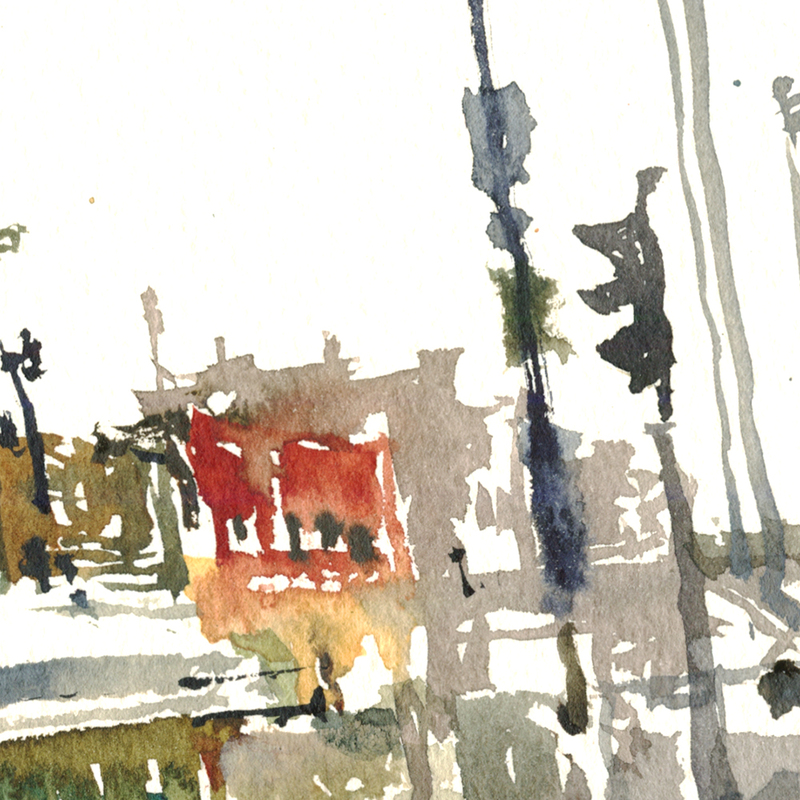 My day one begins on an overpass above a busy freeway, in high winds and direct sun – my first plein air painting day of the year. 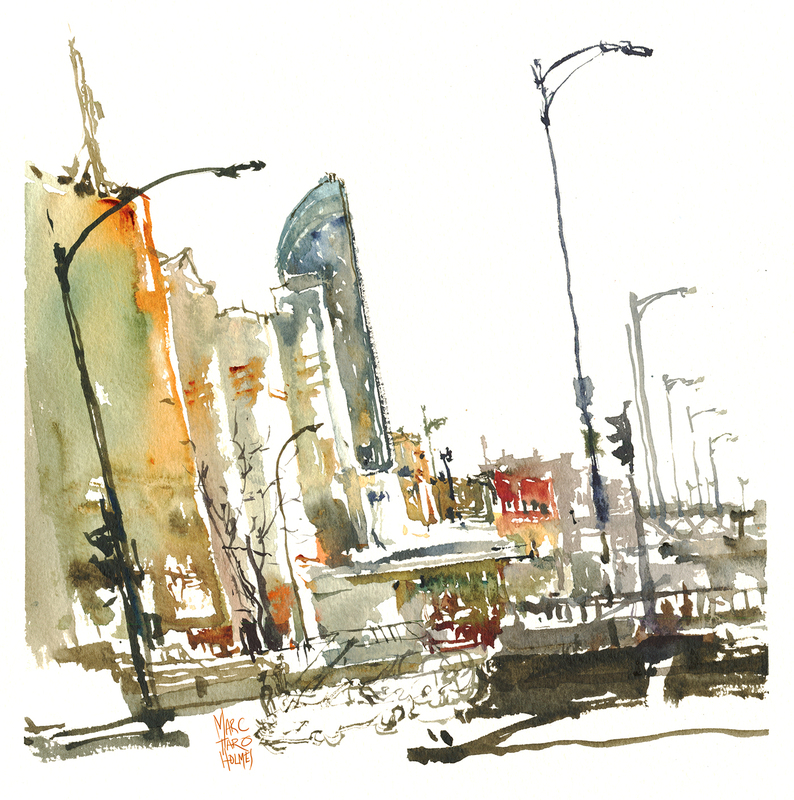 Ed Note: I’m actually in Chicago right now at their 2018 USK Sketching Seminar. But! Luckily I planned ahead. I’ve started my #30×30 early. Don’t worry – I will absolutely do it in 30 consecutive days! I’m doing the same challenge as everyone, I’ve just shifted the time-window. This is a sketch of the Snowdon Theatre. Or, at least the block it’s in. It’s the tall streamline era sign in the middle there. 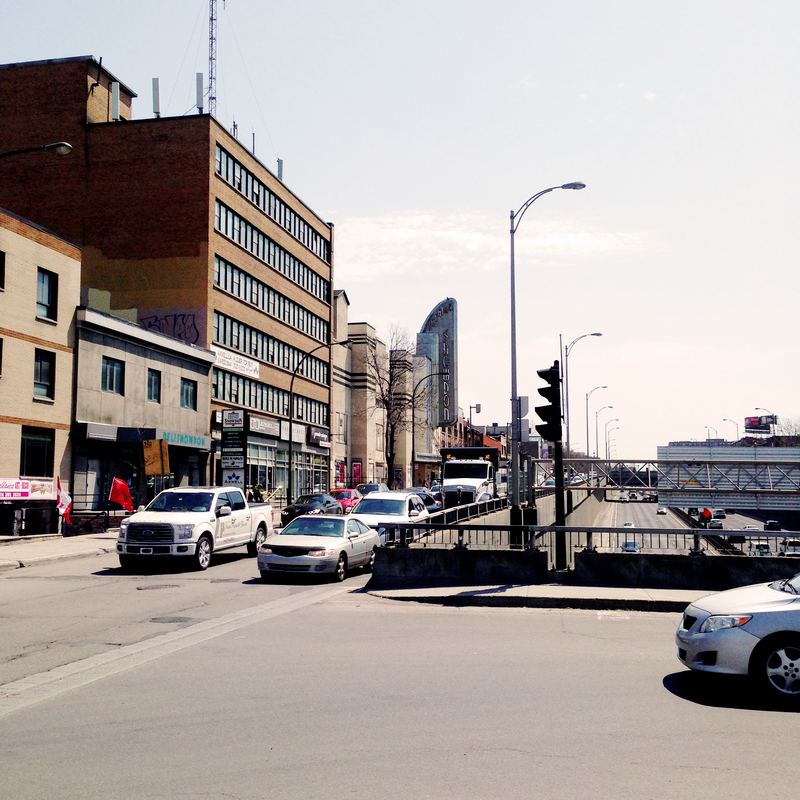 This abandoned neighborhood landmark has been disused for as long as I’ve been in Montreal. There was a sports camp for kids in there for a while, until the place fell so fully into neglect it wasn’t safe for habitation. I suspect the roof fell in or the pipes burst at some point, and that was the last straw. OK so, what went right? I picked a cluttered view, with no clear center of interest. I knew I wanted to draw the old theater sign – but otherwise, it’s just a jumble of boxy functional buildings and freeway-junk. Considering that – I’m quite happy with my version of this un-romantic reality. I think it’s succeeded despite itself. This is a slice of my everyday life, seen as a work of art. What didn’t! I’m so out of practice with street sketching it’s not even funny! Things were so awkward. Constantly searching around for where I put my binder clips, or digging for a brush in the very bottom of my bag, or what pocket has my spray bottle. I’m using too much mental energy on the basic functions of getting paint and paper together, and I think it shows in the painting. There are no clear silhouettes. It’s broken up with patchy white spaces, making the forms dissolve. The flattened lack of perspective, and the strange tilt – while it’s an artistic solution – is also kind of a reflex. A self-defense technique of style over substance. The first solution to complicated perspective is – ignore it! If that was good enough for Cezanne, it should be good enough for me. But still – I feel the stylization is kind of a crutch. You can only get away with playing the artistic license card so many times in a row. ← CSPWC Exhibition May 27 to June 22, Etobicoke ON. This is just the first one! I am sure it will get along the way and to be honest i quite like the result here! Well done! Your description about how you feel about going out for the first time in a while because you are fumbling with equipment and the environment in which you want to work was very meaningful to me! I’m trying to set up an “urban sketching” environment which includes a 3-wheel walker, a table, and a sturdy stool and not look out of place in a leafy neighborhood where I stare at someone’s very attractive home. Set up *is* a big deal!!! I’m hoping as I get out and about more, I will feel less self conscious and can get into the sketching mode quickly. Right now, I am carrying about too much to easily fit into the NY Urban Sketchers activities and hope that I can bring some of its spirit to Hudson County, New Jersey – by Fall, we’ll see if I attract anyone to sketching in NJ, including those who have some motion restrictions. I love it that you didn’t sugar coat the experience! I made a post to my chapter to see your blog. Many people think even the experienced artist never has a few ‘less than perfect’ sketches. Thanks for keeping it real! Enjoy Chicago, wish I was there. I certainly enjoyed the 2016 symposium then did. Meant to go back this year. I love your Montreal sketch and I love the Snowden Theatre. Keep it up Marc as always it will all be amazing. I really hope you have not abandoned ink as part of your art. Those of us who are just starting out need for you to keep us excited and watercolor without ink leaves me behind. I too appreciate your openness to talk about what you perceive as “failure.” Certainly I don’t see it that way but, just not what you hoped it could be. So for those of us who squeeze in our sketches occasionally…..we/I can relate to the frustration. I suppose that is what stops many from continuing. I’m so glad that you continue and continue to learn and amaze us with your work. Thank you for sharing. Have to admit it’s been a long since I’ve been in that neighbourhood but that has peaked my interest.